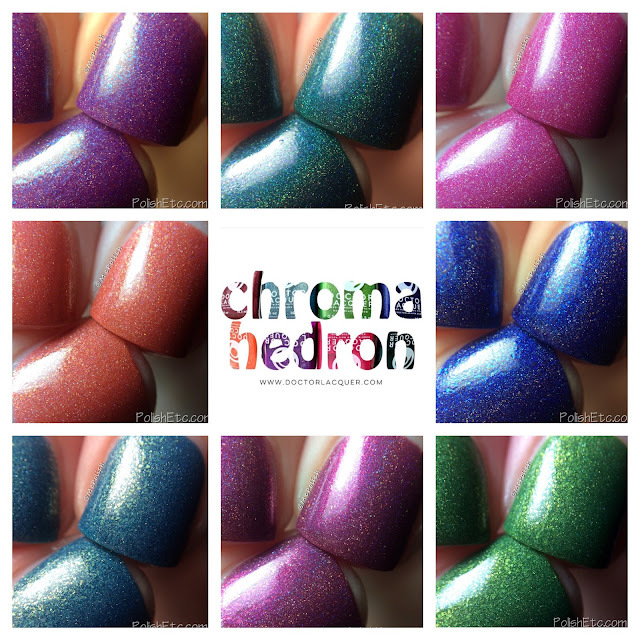 Doctor Lacquer Chromahedron Collection - Polish Etc. Do you like shimmer and microflakies? Then you will love this fall collection from Doctor Lacquer! The Chromahedron Collection is a set of 8 polishes inspired by lesser known semi-precious gems. Jewel tones are a staple every fall and the lovely shimmer of these colors really makes them special. This collection just launched today. They come in both full size bottles (16.5ml) and in medium sized bottles (10.5ml). This medium size is awesome. It isn't like those tiny 5ml bottles with the crappy brushes. They are just a smaller version of the full sized bottles with good brushes. I approve! So let's get into so swatches and macros so you can decide which beauties you want to snag. Click on through for all dat shimmer! "Alamandine" is a deep wine polish with a soft linear holographic shimmer and taupe microflakies. The light colored flakies are not as apparent as they are in other colors in this collection. The formula is great. I used two coats with a glossy top coat for this swatch. "Idolite" is an indigo blue polish with holographic shimmer and bright blue microflakies. The linear holo is strong in this color. This polish applied flawlessly and was opaque in two coats. It did seem to dry less smoothly than the others. You can sort of see the rough finish in my macro. I didn't feel gritty to the touch it just didn't smooth out completely with a top coat. "Apatite" is a grated out blue packed with blue and golden microflakies. Oh my! This is one of my faves from this collection. The microflakies really stand out and just make this polish look amazing. There is a slight holographic shimmer in here but I couldn't appreciate well. I was too distracted by those microflakies! Perfect application with only two coats needed to be completely opaque. "Rhodolite" is a magenta pink linear holographic polish with gold shimmer. The holo is more apparent but the microflakies are less obvious. This color is great though and would look awesome with many skin tones. Again, this had a perfectly smooth formula and was opaque in two coats. "Diopside" is an apple green polish jame packed with golden microflakies. My fave! The microflakies just pop against the base color. The linear holo shimmer is not very apparent but it wasn't missed because of the mesmerizing flakies. Very cool. The formula was nice a smooth and easy to apply. Two coats for full opacity. "Spessartine" is a rusty orange polish with soft linear holo and peach shimmer. This is a perfect fall color. It isn't too dark of an orange but it isn't pastel or coral. The peach microflakies work well here. Again, fantastic formula and I only used two coats with a glossy top coat for this swatch. "Tsavorite" is a deep teal linear holographic with purple microflakies. This is the shade in this collection with the strongest holo effect. The base color is quite lovely as well. I did two easy coats with a glossy top coat for these pics. "Taaffeite" is a purple linear holo with bright blue and purple microflakie shimmer. The blue flakies really pop against the purple base here. It is a very flattering color. Formula was good and I only needed two coats for full opacity. So which one is your favorite? I think all of the blue/green shades are keepers but Diopside and Apatite are definitely my faves. The flakies are just so pretty in those two. Doctor Lacquer has this collection available in single polishes ($11.99 for full sized and $7.99 for medium sized) as well as in full collection sets ($92 for full sized and $62 for medium sized). Here is where you can stalk Doctor Lacquer!